With an average annual growth rate of 31 %, ViscoTec Pumpen- u. Dosiertechnik GmbH from Toeging in Bavaria is one of the fastest growing companies in the German-speaking region for 2019. This is the result of a study for which the magazine Focus together with the data company Statista determined the German companies with the highest sales growth. ViscoTec achieved the 13th place in the “machine and plant construction” sector and thus ranks 310th in the general ranking. The managing directors Martin Stadler and Georg Senftl with the certificate of the Growth Champions 2019. „It is not self-evidently that a company can record such high growth over a long period of time. We are very proud that we can count ourselves among the fastest growing companies in Germany. This shows us that we can trust our employees. They are the ones who are responsible for ViscoTec’s strong and successful growth. With this support, we can look forward to the coming years with confidence and are not afraid to continue to grow“, the CEOs Martin Stadler and Georg Senftl are in agreement. Companies privately owned as well as publicly traded companies were taken into account. 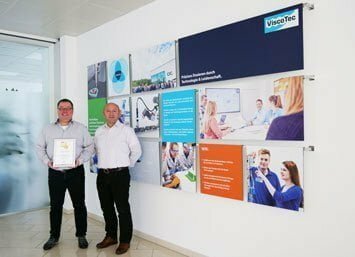 In January 2018 ViscoTec already received the award as top employer of FOCUS-Business. All in all, the dosing technology specialist can look back on a very successful year and considers himself well prepared for the challenges of the coming years. You can find our current job postings here!